EJP Consulting will conduct a review of your company's Health and Safety program based on the WSIB Workwell Audit criteria. 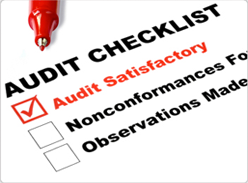 Once the audit is completed we will go through it with your Health and Safety committee to identify strengths in your existing program, identify target areas for improvements, and determine that the Health and Safety policy is being followed by employees. This audit will determine compliance with current Government standards and laws to ensure due diligence. This audit will require an onsite workplace inspection by our staff and upon completion a detailed report will be given to the Health and Safety Committee for your records.